Who is it for? 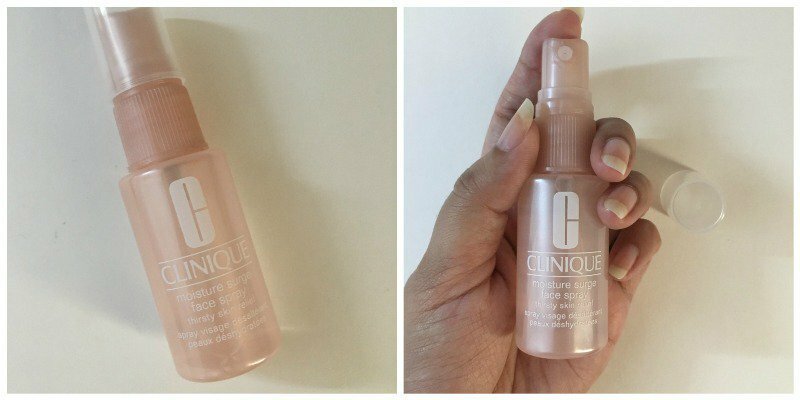 Clinique Moisture Surge Face Spray is for a quick replenishing way to boost the moisture level and soothe and soften the skin. It is for all skin types. Hold the bottle10 to 12 inches from the face and spray a light mist with eyes closed. Use in addition to daily moisturizer, under or over makeup, or whenever skin feels thirsty. This face spray comes in a pale pastel pink spray bottle with a transparent cap. It is compact and convenient to use on the go. Water like consistency and doesn’t feel oily at all. This face spray definitely comes in handy when out. The oil-free formula is a boon for all skin types. The best part is that it could be used before makeup for hydrated and supple skin, and also after makeup for a light dewy finish. However, I only use the spray over the blush after makeup for the glow and not all over the face. I find it more convenient as a moisturizer to hydrate the facial skin evenly and for the refreshing feel while I am out. It is perfect for harsh winters when one feels the need to reapply the moisture as this spray balances out the moisture level and covers all the dry patches. Could be used after makeup for a dewy glow. I somehow did not like the feeling of it when I sprayed it all over the face after makeup. It felt a little icky. So I only apply it over the blush. Yes, it definitely works really well but I wouldn’t term it as an absolute must have product. More from Clinique Moisture Surge Range? This brand makes some of the best moisturizing products for skin..